For me, a train journey evokes a feeling of being in another age. An era when getting from here to there was its own adventure; and the journey was the destination. The last time Carrie and I were in India, we took every chance possible to ride the rails. I always could spend hours gazing out at the countryside and snapping photos, but my favorite experiences were the overnight sleepers. On one such night, I even a poem about the journey. the tracks repeat as I lay there dozing off to a symphony of the rails. A train whistle covers the sound for a few seconds, sometimes more. Then back to the tracks. The buzz of passengers getting on and off the train. the wallas cry at three in the morning. Who wants to be woken up for a tea? People must, I presume, since the wallas continue to call. Sunlight bathes the lower berths. Wake up, have a seat and watch it all go by. Berth (n): an assigned fold-down bed on an Indian train. In Sleeper Class, they come in three levels: lower, middle and upper. After a month of tranquility in Rishikesh, the time had finally come for my wife Carrie, Lauren, Tara and I to head out. Our first stop was Amritsar and the Golden Temple, by way of an overnight train. Our dreams of sneaking down to Tara’s first class cabin were dashed, however, when we realized that her section of the train wasn’t even attached to ours. Literally; her cars were on the opposite track from ours. Once we left the station the two halves joined up, but there was no way to get across the train and say hi. Meanwhile in Sleeper Class, we were fortunate to have three adjacent upper berths. That meant a bit more privacy, a reprieve from the never-ending flow of people, and room for my 6’3” body’s legs to dangle above the aisle without being knocked into while I slept. Our night on the sleeper class train was spent chatting, taking some obligatory photos in our beds and waiting for sleep to find us. By 7am, our train had pulled into Amritsar station and it was time to figure out our next step. 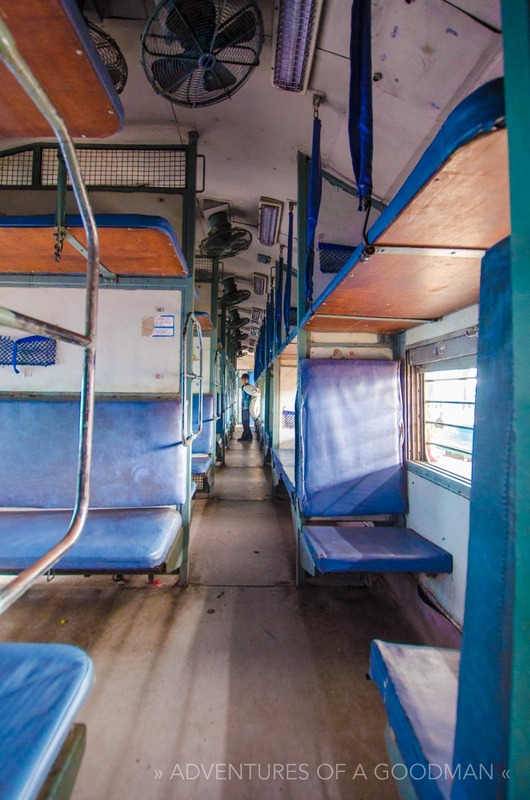 Sleeper Class…the only way to travel around India at night! I once spent the night on a train floor after hopping on without a ticket.